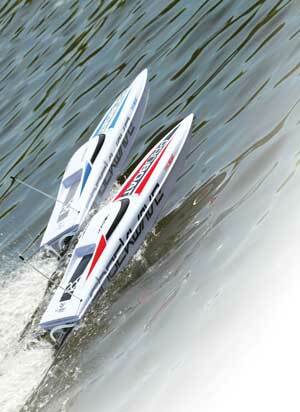 Stirring up the local pond with your favorite RC boat is a great way to spend the day. Doing it with a friend or two is even better when you can race for bragging rights. If you and your buddies are the competitive types then naturally you’ll eventually want to find organized boat races in your area. Something to keep in mind is that two or three guys on a pond is very different from up to ten boats competing for first place on a larger course. Elsewhere in this issue of RC BOAT you will find information on what to expect when you show up at a race event. Here we will focus on some of the rules you will need to be aware of before you take your place on the starting line for the first time. There are two sanctioned organizations for boat racing and we have provided you with links and QR codes for these groups within the graphics on the next page. IMPBA is the International Model power Boat Association. NAMBA is the North American Model Boat Association. Organized events are likely to follow the rules for one of these two groups. Their courses are similar in size with the main difference being the number of buoys used to mark the turns. The IMPBA course is longer than but not as wide as the NAMBA course. Each turn is marked by three buoys. The starting line is always at the center of the straightaway. Lanes are defined by your imagination. Scan the code with your smart phone or go to www.impba.net to check out the rules associated with an IMPBA event. It’s likely that you didn’t have any buoys or other markers to navigate around on your local pond so it may take some getting used to the fact that you now have “lanes” to constrain your driving path. You’ll want to arrive at the event early enough to get some practice time in before the heats begin. The races are run clockwise on an oval course. The turns are marked with either three or five buoys, depending on which rules are followed, with an “invisible” arc connecting them. Drive at no more than half throttle as you learn to judge the distance between your boat and the turn buoys. Ultimately you want to be as close to this “line” as possible without crossing it to avoid any penalties. Your boat must maintain a straight line from one turn to the next. Swerving may add a level of fun on the local pond, but can result in a penalty on a race course. Coming out of the corners be careful not to oversteer into the center of the course. Drive this until you are comfortable with how you handle the entire course. The NAMBA course is slightly shorter and bit wider than the NAMBA course. Each turn is marked by five buoys. The starting line is always at the center of the straightaway. Scan the code with your smart phone or go to www.namba.com to check out the rules associated with an NAMBA sanctioned race. It’s one thing to master the course when you are the only one on it. It is another thing to master it with other boats around you. It is important to keep an eye on where they are and stay in control of your boat while navigating through the wake of others’ boats. It’s time to hone your peripheral vision and reactionary skills. Start with just one or two other boats if possible. Try to enlist the help of some of the experienced racers. Most are likely to be willing to help a newbie. Drive the course while in close proximity of the other boat(s). Begin by first following slightly to the rear and off to the right. Keep your focus on your boat while observing, anticipating and reacting to the movements of the others. If they sweep wide on the turn you need to sweep just a bit wider. As the distance between boats becomes greater you still need to remain conscious of their locations. This is where peripheral vision comes into play. Eventually you want to be able to shift your vision to the other boat briefly while keeping your boat in your peripheral view, but this will come with experience. It is critical to be aware of what is in front of you and to the sides at all times. Don’t worry about what’s behind you. It’s the responsibility of the drivers behind you to pay attention to what is in front of them. There is are right ways and wrong ways to pass another boat. The yellow boat at the top of the course has illegally passed the red boat. Penalty points are applied for crossing the line between the two buoys that define the straightaway. Since the line is only imaginary it is a judgement call by the race officials. The lower part of this graphic illustrates a clean and legal pass by the yellow boat. It has passed on the outside and did not take over the inside lane until it was at least three boat lengths in front of the other boat. When boats are passing each other there is a great potential for a collision. It’s important to plan ahead as much as possible to avoid any mishaps. The blue boat on the left of this image has just safely and successfully passed the red boat. It is heading straight and will move over once it has put at least three boat lengths between his stern and the other’s bow. The blue boat on the right, however, is about to potentially take both boats out of the race by trying to overtake the red boat much too soon. There are indeed lanes, however the lines defining them are imaginary. They are basically as wide as the boats that occupy them. You are at the mercy of the race officials when it comes to lane infractions. At any given time the boat closest to the buoys has the inside lane. You are permitted to pass this boat and overtake the inside lane but always pass on the left (outside) and do not pull in front of the other boat until you are at least three boat lengths ahead. Four or five boat lengths will help avoid a penalty call if the officials don’t see the same three boat lengths that you did. Changing lanes behind other boats require focus. You will have the boat’s wake to deal with so you should cross it at about a 45 degree angle to avoid upsetting your craft. Avoid the rooster tail of water being showered your way as well as this has the potential to make your boat unstable not to mention the possibility of water getting into the hull. If another boat has passed you and enters your lane as it approaches the turn, you may need to throttle back to let him in. You always want to play nice because the table could be turned on the next lap. Lane infractions are another way to obtain penalty points. the red boat has crossed the imaginary line inside the outer most buoy and continued on the course. This is illegal. The Blue boat, while also crossing the line, looped around to pass the buoy on the outside. This is legal and will not be penalized. Jumping the start is not uncommon, especially with newcomers to boat racing. This is not a penalty infraction, however. In this image the red boat has jumped off the line just prior to the start of the race. It has to complete the lap and cross the starting line to officially start his race. There are several ways to be penalized. Many are going to be based on the officials interpretation of what they saw. You may not always agree but you always need to smile and nod then move on. Some of the infractions are described with the graphics on these pages. You can have a penalty called for something as simple as cutting a buoy on the turn or something more serious like running into a dead boat. Sometimes you can get away with a warning for a lane infraction if no other boat was affected. Again, it is up to the individual race official. Each organization has its own set of rules and penalties so it’s best to download their rule books and familiarize yourself with them prior to entering a race. The more you know going in, the better off you will be once your names is on the roster. The bottom line here is that racing can be a fun part of any aspect of the RC hobby. Just as with car and truck races there are rules you need to know, some official and some are just commons sense. Practice driving close with your buddies on the local pond because proper control is only learned through experience. Keep an open mind and remember this is all about having fun with a little competition. After all…these are basically toy boats. Keep the stress low and the fun high. Now go race something!